There are many different brands of coffee making machines on the market today. How do you decide which is the best drip coffee maker for your money? It’s important to note that different brands of coffee makers come with different prices. And in turn, these prices differ depending on the features, accessories and technologies used by each one of them. 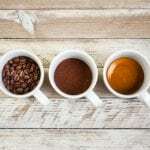 Therefore, you will find that some coffee makers combine different technologies such as programmable settings, brew strength controls, pause and serve options, self-clean cycle features and auto shut-off options to achieve more desirable results. 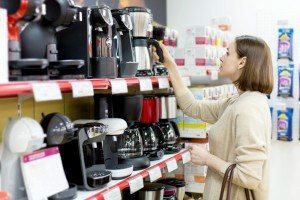 After an in-depth review, we have compiled a list of 5 drip coffee maker brands which are able to produce high-quality coffee both to small families and large companies. 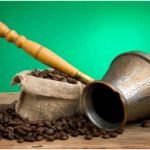 What determines the best drip coffee maker? 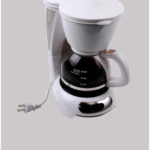 Different brands of the drip coffee makers come in different models and sizes. As some are designed to brew a single cup of coffee, there are other, bigger-sized models which are designed to brew up to 12-cups of bold coffee at a time. If you’re using this coffeemaker for your own home use, it’s better to purchase the single cup unit to save on cost and power. However, if you wish to purchase a coffee maker which will serve your entire office staff or large family, it’s advisable to go for the bigger units which can brew 10-12 cups without hassle. 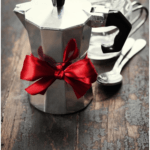 What makes a drip coffee maker the best? More and more products have flocked in to the markets today which come with almost similar features and technologies but varying output capacities. One feature which makes a good coffee making machine are the programmable settings. With this feature, you’ll need to set the time the machine will start brewing so that you can enjoy a bold and delicious java. Also known as bold, strong or aroma, this feature slows down the water flow to brew a concentrated cup of coffee. This feature notifies you when to clean your coffee maker. Some may take a considerable period of time while other may notify you periodically. A coffee maker with high-quality water filters is able to eliminate chlorine, odors and other contaminants from your water to give you a good-tasting coffee. These filters are, however, replaced after some time to avoid bacteria buildup. The top coffee makers come with powerful heaters which are able to brew hot coffee at an average temperature of 195°-205°F. The dedicated double-walled thermal or glass carafe also helps to keep your coffee warm for hours. In order to ease the process of purchasing a drip coffee maker, we have researched and included the top five best coffee-making machines which are available on the market. Take a look at their features and pros and cons to have a better understanding. The Zojirushi Coffee maker 5 cup is a little coffee drip machine which features a 650 watt heater which brews up to 5-cups. It contains a filter cone, a removable water reservoir, a replaceable filter and a stainless steel casing which has a stylish look and is durable. With an incredible performance which makes it one of the top coffee machines on the market. 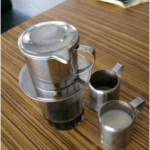 This unit also happens to be the cheapest and the simplest coffeemaker so far. It has a light weight of 9 pounds and sleek dimensions of 6×9×11 inches. All in all, if you’re that person who enjoys drinking hot coffee during long nights or working hours, this Zojirushi Model Coffee maker is the perfect choice for you. It has great features which are energy-efficient and the price is friendly and affordable to most customers. These guys have been in the line of producing good-tasting coffee for a very long time. The company, which is located in the Netherlands, is responsible for the manufacture of the Moccamaster KBT 10-Cup Coffee Brewer which is a top-rated coffee-making machine on the market. This coffee brewer features a powerful heating element which enables this unit to brew up to 10 cups of coffee at a time. It has a stainless steel thermal carafe, a temperature consistency of 196°-205°F and materials which are SCAA and SCEA approved. It has dimensions of 7.1×12.2×15.4 and a weight of 6.5 pounds. Despite its high price, the Moccamaster KBT 10-Cup Coffee Brewer is the best coffee making machine due a number of reasons. Therefore, of purchasing cheap coffee makers which never fulfill the intended purpose, it’s better to save your money and go for a top-rated coffeemaker which will never disappoint you. 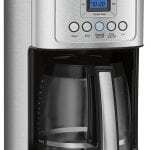 The Mr. Coffee Programmable Coffeemaker is a stylish and modernized coffee-making machine with brilliant features which include an on/off LED indicator, a pause and serve option, a removable water reservoir and a brew strength selector to set the exact type of coffee you wish to drink. This unit also comes with a glass or thermal carafe and a stainless steel decanter which is durable and rust-proof. 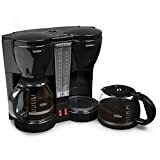 The Mr. Coffee 12-Cup Programmable is very cheap and affordable to all customers and comes with a weight of 4 pounds and dimensions of 11.1×9.1×14.4 inches. 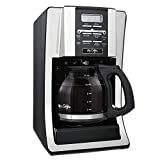 Overall, the Mr. Coffee 12-Cup Programmable Coffee maker is one of the best coffee makers for your money. If you ever complain about quality, taste or performance, it’s time to try this coffee maker and I bet that you’ll experience something new. With a 4 star rating from 4,821 verified customers, it’s evident that this Mr. Coffee model is the best 12 cup coffee makers on the market. The BUNN BT Velocity Brew Coffee Brewer is a coffee-making machine which lets you enjoy a hot, delicious beverage at the comfort of your office or your own home. Designed with a mix of high-quality materials and an invigorating classic brewing technology, the BUNN Velocity Brew can brew up to 10 cups of good-tasting coffee for your family or for small offices. It features a removable reservoir, a stainless steel double-walled thermal carafe and an 800 watt heater with an inbuilt thermostat. 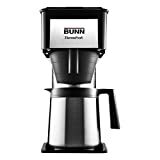 With a light weight of 9.2 pounds and dimensions of 17×20×15 inches, this BUNN model coffee maker is one of the best drip coffee maker that is perfect for both home and small office use. The BUNN BT Velocity Brew Coffee Maker is a great coffee making machine, which brews bold coffee within three minutes. 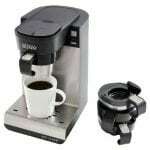 Assembled in the USA, this coffee maker is built with high-quality materials. 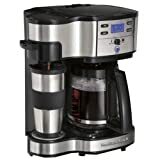 For those of you who enjoy drinking a single cup of coffee or brewing multiple cups of bold coffee for your friends and families, the Hamilton Beach 2-Way coffee maker may be the perfect choice for you. 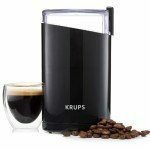 It has a stainless steel finish, dishwasher safe parts, a programmable clock and the ability to brew a single cup or multiple cups of delicious coffee within two minutes. It has a light weight of 2.2kgs and dimensions of 34.8×29.1×39.2cm. This unit is economical and energy efficient. In summary, the Hamilton Beach 2 way flexbrew is the unit to consider if you wish to brew a single cup of coffee or multiple cups for your guests. 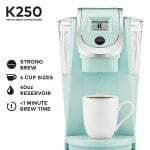 Due to the great features, multiple functions and, of course, a cheap price, this coffee maker is highly-affordable to people living on a tight budget or those looking for cheaper alternatives. Different companies manufacture different models and types of coffee-making machines. Therefore, if you’re looking for a good quality coffee maker which is able to brew multiple cups of quality coffee, for instance, the Mr. Coffee 12-Cup Programmable and Zojirushi EC-DAC50 Zutto 5-Cup Coffeemaker are the best choices to go for. The only difference between the two is the number of coffee cups each can brew. However, customers who are always looking for quality and something engrossing that will last for a long time, should consider purchasing the Moccamaster KBT 10-Cup Coffee Brewer. We also have the BUNN BT Velocity Brew Coffee Brewer which has a powerful heating capacity, an insulated stainless steel carafe and the ability to brew 10 cups of coffee at a time. And finally, we have the Hamilton Beach 49980C 2-Way Coffeemaker which only brews one single cup of delicious coffee and is ideal for young couples or students who enjoy studying at night. With such brilliant information at your disposal, it’s up to you now to traverse round every shopping mall, store or shop easy with online shopping now, to get the best drip coffee maker for your money!! 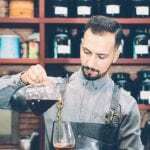 5 Important Tips For Buying An Inexpensive Coffee Brewer!